Leaning into the microphone, Ryota Niitsuma led his remarks on Ultimate Marvel vs. Capcom 3 with not so much a piece of news as it was a reminder. "There will be 12 new characters in the game," the game's producer said (through an interpreter) "though I'm sure you already know all the information about that." Wednesday's leak of all new characters for Ultimate Marvel vs. Capcom 3 stole much of the game's promotional thunder, but it still had news to reveal during a panel at Comic-Con 2011. Regarding the leak, Capcom felt it best to acknowledge the elephant in the room, and then refuse to talk about it. "Because we're all adults here, you all know there are only four characters announced so far," Niitsuma said, to laughter. 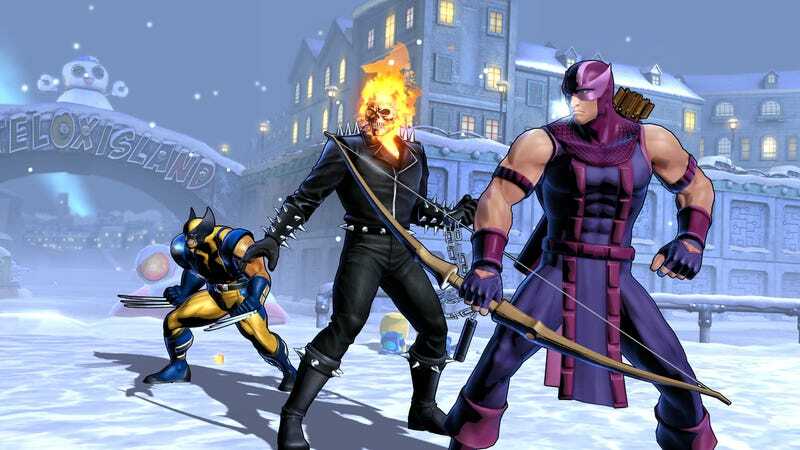 Further, "evil versions" of characters, inspired by the 1990s Super Nintendo game War of the Gems will make their way into Ultimate Marvel vs. Capcom 3. Evil Hawkeye, Iron Man and Wolverine were shown. Finally, pre-order downloadable content bonuses were announced, all being four-packs of variant costumes. GameStop preorders get Storm, X-23, Chun Li, and a Morrigan referred to as "Casual Friday Morrigan" in-house, said Capcom's Seth Killian. Best Buy preorders get C. Viper, Wesker, Super Skrull and what can only be called "Elvis MODOK," although as Killian put it, "Please, call him Graceland Modok, or we'll have to pay a lot of money." Amazon pre-orders get a traditional-looking Sentinel, Doom Wars Doctor Doom, NES-inspired Strider, and "Cyber-Akuma". As they did last year at Comic-Con, Marvel and Capcom battled it out at the end of the panel, each side choosing a gamer from the crowd to represent them. Baker picked Dios -X-, whom Killian recognized as a top-flight MvC competitor, accusing Baker of planting a ringer in the crowd. Indeed, Dios (a San Diegan) prevailed with a lineup of Doctor Doom, Storm and the Sentinel, finishing with Doom K.O.ing Hsien-Ko. "The new tweaks they've put in, they've done things they really need to do with the game," Dios said later. He specifically cited the ability to use X-factor while midair, not just on the ground. The expansion of that capability "adds a new dimension to chaining combinations," Niitsuma told the audience. "You will have to revamp your fighting strategy."